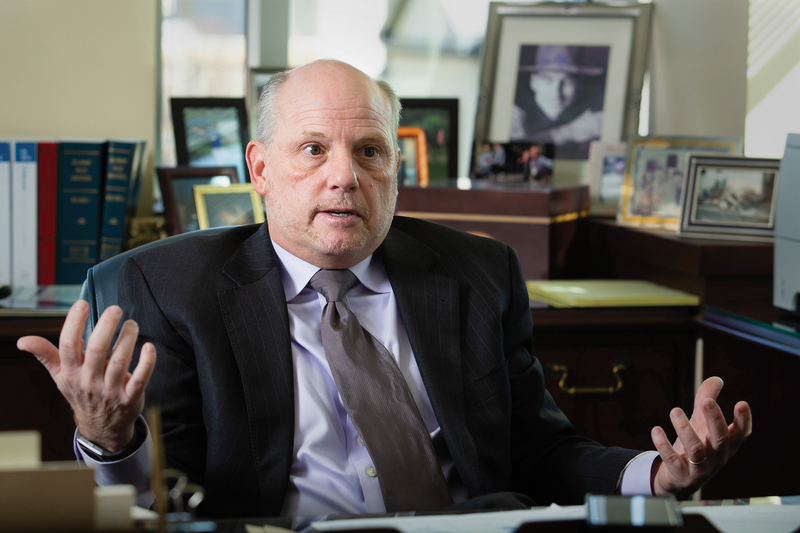 Influential corporate law judge Leo Strine discusses the role directors, investors and executives can play in curtailing income inequality and strengthening societal good. 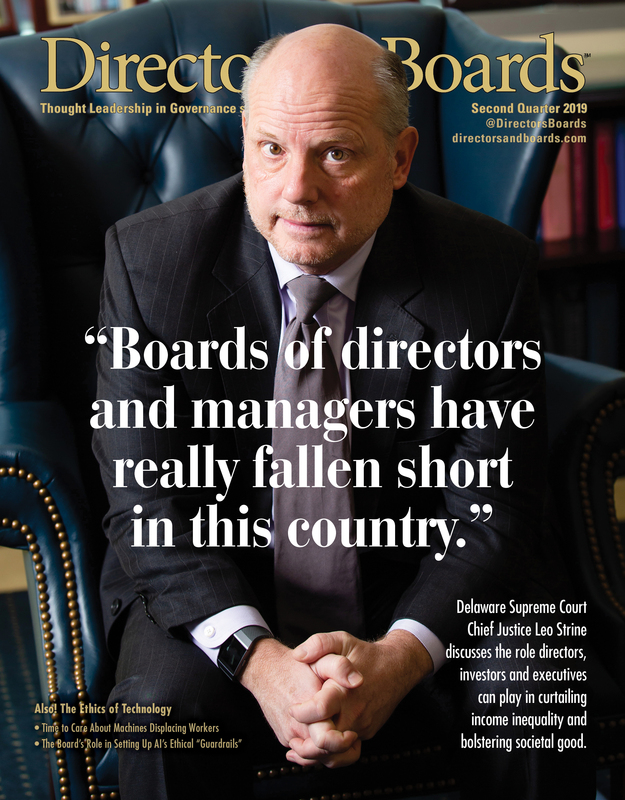 The continued undervaluing of employees has brought corporate America to a precipice, and in order to keep the economic system from buckling, institutional investors, management and boards need to look in the social-purpose mirror, says the nation’s most influential corporate law judge. The economic pie has grown considerably, says Delaware Supreme Court Chief Justice Leo Strine, but the rank and file’s share is much less than it was 30 years ago, which affects the community at large. That’s led to more income inequality and less satisfaction, and is the result of actions by large investors and corporate leaders. “There is going to be a level of inequality where people are just not going to take it. Frankly, they’re not going to trust business elites and for a good reason,” explains Strine, who heads the high court in Delaware, a state where two-thirds of Fortune 500 companies are incorporated and whose corporate laws are often considered the de facto law of the land. The following is a Q&A with Strine, who sat down with Directors & Boards to share his thoughts on what directors can do within the confines of the law to embrace the growing environmental, social and governance movement. He offers his insights for our year-long “The Character of the Corporation” series, which explores the very essence of a company’s approach to generating a profit and how that impacts all stakeholders, employees and communities, and not just shareholders. Strine’s answers have been edited for length and clarity. There are many directors who want to focus on environment, social and governance issues (ESG), but what if their actions to bolster social good end up impacting company profits? A lot of my focus has been on what the obligations of institutional investors are to align their behavior with the interests of the people whose money they have. If you can get more of that thoughtful thinking, then perhaps the incentive structure for boards is less moment to moment.Things like environmental shortcuts, product safety shortcuts, treating workers unfairly tend to get caught out over the long term. So some of the tensions really are resolved, and create a more productive incentive structure for boards and the managers, if the people who are voting the stock actually adopt the perspective of the people whose capital they control. All of us breathe air, all of us drink water. None of us wants any particular company in our portfolio to get artificially rich by poisoning us. Also, we pay for those externalities as investors and as human beings, so those externalities are costs to us. We don’t really want directors in any particular company violating the law. And by the way, under Delaware law, they’re not allowed to do it. Blackrock and Vanguard and others are starting to acknowledge their responsibility to think about sustainability, to acknowledge that they need to align their voting principles with their long-term investors. I think that’s a healthy development, and hopefully sets us on a better path where we can all begin to make the system work a little bit better for everybody. When you see someone like a Larry Fink, Blackrock’s CEO, put out a statement last year on this issue of social purpose, a lot of what he’s proposing puts the onus on the board. Is that justified? understand the industry. And some of the rules and incentives can get so tight that we actually discourage people with the right kind of qualities from serving on boards. It doesn’t really matter if you’re independent if you don’t have expertise. But can you be independent and also have the expertise and the knowledge? I’m sure you can. We just independent director-ized the world. We went from having a bare majority of them to having a supermajority of them. We don’t actually empower them. We take away their ability to think long term because we put in place Say on Pay. We don’t do Say on Pay every four years or five years, where you would really have a long-term pay plan, we do it every year as a vote on generalized outrage. Corporate management and employees are the most important thing to corporate success, especially employees — who, frankly, boards of directors, managers and institutional investors have undervalued for 30 years — which is part of why there are the tensions we have in society right now. But I think it’s been healthier to have Mr. Fink saying, “We hold people’s money for the long term for long-term investors, and companies behaving in a responsible way and creating wealth that’s sustainable is important to our investors. And we understand that we need to take that into account.” I viewed that as a very constructive step. Is it this phenomenon of bringing in more independent directors that may have inadvertently caused a lesser focus on doing the right thing for employees and the community? Independent directors are not like trustees at universities, who usually have prior affiliations with the university and the community in which it exists, and that they care deeply about. Independent directors are weather vanes for the market. Not to denigrate them, but let’s think about the definition of an independent director. They tend to have no prior affiliation or current association with the company, and thus they really have no reason to deeply care about it or any aspect of it. Now you can say that’s independence, but it’s also a blank slate. There’s great competition to be an independent director. Independent director pay has gone up. The typical pay just to be on one company board is higher than my judges in our judiciary. If you’re on three boards, you’re often making more than a half million dollars a year just as a director. The old concern was that directors had to be popular with management to stay on boards, but now you have to stay popular with the institutional investor community and with the proxy advisers, and therefore these directors are highly responsive to market sentiment. Are you saying that the democratization of the governance process, which also includes having more independent directors, inadvertently created an incentive that went against the greater community? There’s been a big increase in the power of mobilized capital over the last 30 years, which has put more and more demands on companies to be responsive to the stockholders. We didn’t globalize the protections for labor, for the environment. We globalized it for capital. Those companies have naturally looked to downsize — to frankly change — the gain-sharing with the stockholders in labor. Perversely more of us have been forced to become stockholders in order to save. It’s not clear that this so-called benefit for the stockholders has really benefited most of us, because most of us owe most of our wealth to our job and our continued access to a job. And I also think the frustration for directors and for managers is that the marketplace oscillates pretty wildly by the moment, and that’s not how you can really run a business if you want it to be successful over time. The struggle is to align the powerful input that the market provides with the interest of those people it’s supposed to serve. That’s where I think folks like Larry Fink are starting to have a conversation about this. Vanguard is very healthy because no one thinks you should manage companies quarter to quarter, but no one denies that there are huge pressures on companies to be attentive to their short-term results and they spend a lot of time doing that. Companies have become more subject to the immediate pressures of the market. The easiest way to respond to that is to put downward pressure on the pay of working people. It also puts pressure on companies to perhaps take shortcuts on compliance in a way that’s unhealthy. I don’t think ultimately that serves investors because it’s probably not a sustainable way to make increased wealth over time for a society. And so if we can rebalance things a little bit where we give companies some breathing room, hold them accountable, but recognize that they’ve got to make money in the old fashioned way by selling good products or delivering quality services — and that there isn’t a gimmicky way to get around that — then I think we’ll be all for the better. What would you tell an independent director who wants to balance that? Should there be a list of priorities when they sit down and discuss this in the boardroom? I don’t think you have to think about it that way. For all independent directors, the best way to do your job well and stay out of trouble is to think like you do in your day job, and to think of the company as if it’s your asset. Think about how in five years, if you want this company to be productive, what kind of workforce you need and if it’s really sustainable for the company to thrive if you’re not giving the workers solid increases when they deserve it. I’ve always done this test, and I’d like directors to think more about this. The CEO is worried because he’s now at the 72nd percentile of CEO pay and he wants a $5 million bonus. I’m not really that good at math, but I think $5 million is five thousand $1,000 bonuses. What would be the comparatively best thing for the corporation? For that CEO to get $5 million on top of his already $12 million a year, or to say to your 5,000 employees, “We’ve had a really good year. Each one of you has $1,000, please take your spouse or your kids or your family and have a nice long weekend on the company. We really appreciate what you do.” My sense is 5,000 people will be juiced up because you appreciate them. Plus, about 2,000 of those people probably have a really important bill that they can pay off. Do you have to make a profit to be a for-profit company over the long run? You do. But there’s a responsible amount of gain sharing that’s supposed to go on with the workers whose capital is contributed every day. And that this really matters to businesses and it matters to our society. That’s, to my mind, where boards of directors and managers have really fallen short in this country over the last 25 years. I’d love to see two forms of compensation, really solid cash compensation and some form of restricted stock and then a requirement that when you have too much restricted stock you have to sell, so that nobody gets too much of a share in the particular company. But we have all these exotic pay plans that are impossible for people to understand. We’ve extended them to boards of directors. We’ve made some simple things pretty, pretty hard. So how do boards move forward on dealing with ESG? Those are some of the questions that are starting to be asked. I think it’s a good thing. Does this end up in court? That’s the issue. I believe, for example, that the Congress of the United States can create national parks and they can protect the environment and they can support the arts. That doesn’t mean we have a multi-constituency U.S. Constitution where the trees and musical notes and literature are equal to human beings, right? It means that human beings can have values that are different than money or other things, right? Well, who are ‘we the people’ in the corporation? The only folks who vote are the stockholders. They’re the ones who get to sue, they get the vote on the transactions, they get the vote on the board of directors. So ultimately, if you’re talking about the purpose of a for-profit corporation, many American states have laws that say the directors can consider the interest of all the constituencies. But those corporations don’t behave really differently than those in states that have different laws. Why? Because all of them have boards of directors that are entirely elected by one constituency, the stockholders. Ultimately, it’s unrealistic to expect boards of directors to give greater weight to the interest of other constituencies than their stockholders really will allow them to do. There’s no case — there’s absolutely no case — that bars a company from saying, “You know, in the 1970s when we went through an economic recovery, or the 1960s, or the ’80s, we used to share a substantial amount of the upside of that recovery with our workers, because we knew during the tough times we wouldn’t give them raises. We would lay them off. We’re going to commit to the same level of gain-sharing that we used to give, and we’re going to do right by our stockholders. When we do better, our stockholders are going to do better. But we think it’s important that the workers actually share that, like they used to.” There is no Delaware case that would ever prohibit boards from doing that. We want our economy to produce good jobs. When we work hard and our enterprise succeeds, we would like to think we get a fair reward for that and we would think that our fellow workers at other companies should as well. In addition, we breathe air, we would like it to be clean. We drink water, we would like it to be safe. We use products, we would like them not to harm us. We use services, we’d like to not be defrauded by them. We invest in a lot of companies and if one of them does something wrong, we as taxpayers and citizens have to make up for it. So we don’t really have an interest in any of them acting in a particularly skeevy way. We want them all to try to do their best in a responsible way. If the people who control our capital would assume that same attitude and vote in a way that accords with that perspective, then that gives the people who are running these businesses day to day — and the boards of directors who were helping the people who run the business — more breathing room to take into account the actual things that matter to making a society one you want to live in. So to swing the pendulum, do you think that we need some major sea change, like new legislation to bolster long-term thinking and ESG? I don’t think there’s any one thing. I want to be very positive toward what the index funds are stepping up to the plate to do. I think they need to do more. I think their abstention on the political spending question is tragically misguided and inconsistent with their whole focus on ESG, but let’s give them a chance to get there. Do I think there needs to be a major rebalancing to make sure that the system works better for everyone? Yeah, I do. We really risk losing what we most value if we don’t understand that we got to the place where we defeated fascism and found a different way than communism by recognizing that the market system has to work for everybody. It’s not working as well for everyone as it used to, and if that doesn’t change, you’re going to either have the more optimistic vision, which is the Bernie Sanders ‘Let’s try to return to a stronger form of a New Deal kind of economy.’ Or you can have the more nihilistic ‘Brexit, tariff, get-behind-our-walls’ approach. I think the latter would be disastrous. I think the people who manage companies, though, need to look at where the median wage is. The pie has grown considerably, but if the share of the pie that goes to the many — the people who go to work every day — were the same as it was 30 years ago, then there’d be a substantially less amount of inequality, and there’d be a lot more satisfaction. If the folks who are running businesses don’t want to see legislation passed, then they’re going to have to do something about that. No one ordered them to cut the returns to their workers. Anybody who thinks the gig economy is the answer, I’ve yet to hear that from any of them who work in it. There’s nothing new about undermining well-paying jobs. I don’t see that as progress. Progress to me is that we find a way to include the folks that we’ve discriminated against in the blessings of our prosperity, the people who are willing to go to work and want economic security. That was the vision that Roosevelt had. That was the vision that was embraced by our Allies. And that’s the one that is at risk. When people feel insecure, they get scared. And one of the historical ways people have exploited insecurity is to blame the other. And you know, I think we need to get away from that. You’re seeing in the business community and the investor community a recognition that we do need to improve. And if the investor community will really do its part, that will allow the directors and the managers to strike a better balance.